The Kogi truck served me my landmark fiftieth Los Angeles-area taco meal of the year. Kogi was our choice for lunch because Carmen and I had reason to go to Venice today, not because I wanted it to symbolize the big number 50; but it is a fitting choice because of its cultural import. No 2010 survey of the Los Angeles Tacoscape would be complete without a trip to Kogi, which surely deserves the credit it receives for spawning the entire gourmet food truck scene, having made famous both the Korean fusion taco and the use of Twitter to cultivate (by which term I mean “create a cult”) a following. There are at this moment 1721 reviews of Kogi on Yelp! Kogi is surely among the most reviewed institutions in town, an index of its popularity. 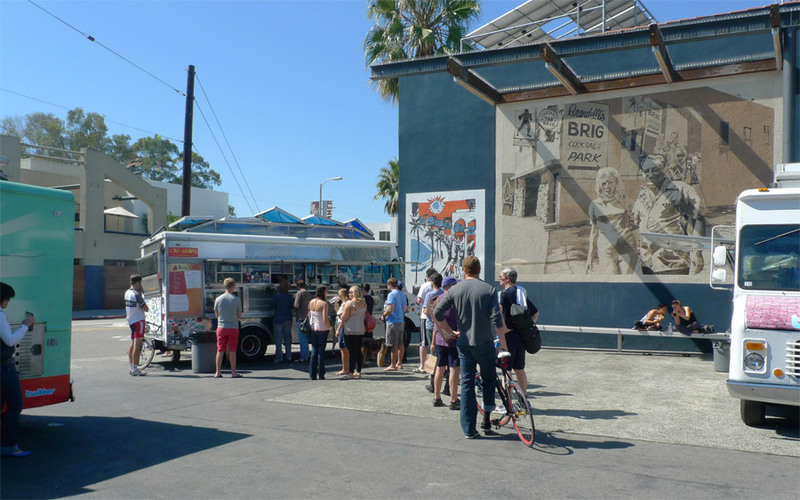 Kogi has grown to a fleet of five trucks, and chef Roy Choi’s name now appears all over town. Kogi truck “Verde” was parked in the lot of The Brig, a designy bar in the hip part of Abbot Kinney; but despite that fact, and Kogi’s early reputation for attracting hipsters willing to queue for hours for its distinctive tacos, the crowd today was diverse and civilian, looking like normal people out for neighborhood lunch on a pleasant, sunny afternoon. We didn’t wait long to be served. The intended scope of the Cincuenta Taquerías project is the platonic taquería – not trucks, not gourmet taco restaurants, not purveyors of contemporary fusion foods, nor vendors of the O.G. hard-shell-and-cheese taco, nor restaurants that make specialty of anything other than tacos. But making a sufficient survey of the Tacoscape compels branching out to these interrelated typologies. 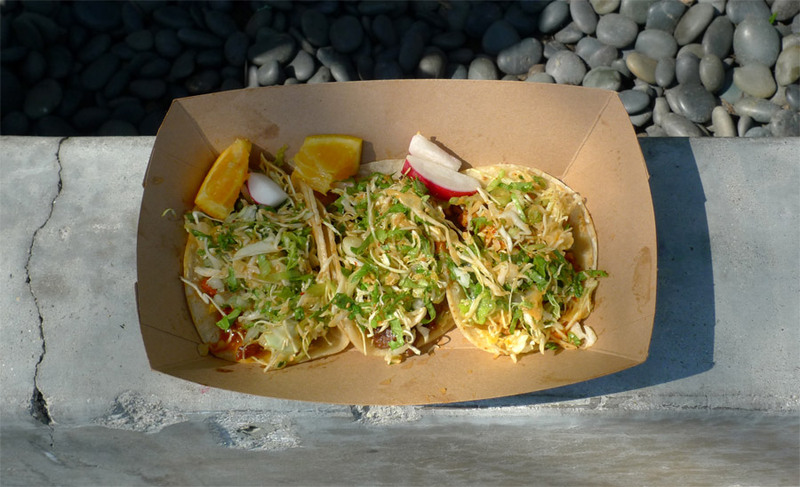 Kogi is a truck purveying near-gourmet fusion tacos, but its influence on the taco environment cannot be overstated. It has been a great evangelist and gentrifier, popularizing and demystifying the taco truck for the middle class. When you see a row of overpriced, derivative gourmet taco trucks parked in some douchebag neighborhood, you may rightly be annoyed; but you should not hold Kogi responsible for the sins of its imitators, any more than you should hold Quentin Tarantino responsible for the spate of crap knockoffs that followed Reservoir Dogs and Pulp Fiction. I ordered three tacos, one each of the short rib, the spicy pork, and the chicken. Considering Kogi’s popularity, their tacos are surprisingly cheap at $2.00 each and above average in size. The thick aroma of sweet, smoky Korean barbecue billowing out the back the truck whetted my appetite. My three tacos did not look particularly good to me – all you see is a pile of salad with some tortillas beneath them – but do not fear, because they are so tasty. These tacos do not possess the attribute of minimalist elegance that distinguishes the traditional taco. Carmen remarked that the Kogi taco might be described by the judges appearing on Cooking Show Dotchi as a “festival of flavors,” which is correct. There are too many competing flavors for a simple-minded taco eater like myself to comprehend the discrete elements and flavors that make up the taco; but the important aspect of it, Kogi’s critical revelation, is that sweet, marinated Korean BBQ meat makes an excellent taco filling. The sweetness, the sesame and peanut, the light crunch of the high-piled salad do not resemble a typical taco, but it’s a winning combination in its own right. Importantly, the tortillas were good – doubled, leathery, with a slight crisp that enhances the taco. I ate the spicy pork first. The pork has some ancestral resemblance to al pastor, bits of thin-sliced filet, sweet and savory. It’s a bit spicier than the short rib, which is a bit sweeter and tastes like a fast-food version of real Korean BBQ-restaurant marinated short rib. It’s addictive – I wanted more. The chicken is similar to the pork, a little blander. If Kogi’s tacos have a fault, it’s that the meats are all too similar to one another – beneath the whirlwind of fusion flavors the meats all have the same basic effect. But that’s not really a fault, since the tacos are all so tasty. Carmen had the chef’s special calamari taco. This $3 premium taco traded the heap of salad for an overabundance of fried squid rings buried under sesame seed-speckled hot sauce. The flavor was stimulating and the taco form makes an effective squid delivery device. Do not fear for the end, my half-dozen taco blog readers. Fifty taco shops was my stated goal for the year, but it was only a minimum number. I intend to continue the project aggressively through the rest of 2010 and visit taquerías sin cuenta. “demystifying the taco truck” – the highlight for me, along with the flare of indignation about the douchebag neighborhoods and crap imitators.